Idaho Supreme Court (Law Clerk), Boise, ID, 1971-1972. U.S. Marine Corps (Captain in Judge Advocate General’s Corps), 1972-1975. 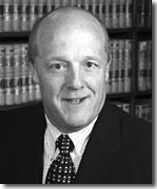 Hawley Troxell Ennis & Hawley, Associate, Partner, Managing Partner, 1975-2004. Washington Group International, Inc. (now URS Corporation, Energy & Construction), Vice-President, Litigation & Claims, 2004-Present. Idaho Law Foundation, 1988-2004, Board of Directors, 1990-1995, Vice-President 1993-1995.
International Association of Defense Counsel (Idaho Member), 1998-Present. Federation of Defense and Corporate Counsel, 2004-Present. Certified Construction Arbitrator and Mediator, American Arbitration Association, 1991-Present. Member, International Association of Defense Counsel (Construction Litigation Committee). Panel Member, AAA Large Complex Case Panel (Construction) Arbitrations, Idaho, Montana and Utah. Member, ABA, Forum on the Construction Industry (Construction Litigation). Fellow, American College of Trial Lawyers, October 30, 1999-Present. Best Lawyers in America (Construction Law), listed until 2004 when left private practice). Author, Responsibilities and Liabilities of Prime Contractor in Certifying and Compromising Claims of Sub-Contractor for Adjustments in Federal Construction Projects, treatise prepared for Washington Group International, Inc., 1999. Author, Report on Compliance with State and Federal Regulations Concerning Minority, Disadvantaged, and Women-owned Business, for Washington Group International, Inc., 1987. Author, Practical Course in U.S. Construction Law, prepared for Gotaverken Energy Systems, Ltd. (Toronto, Canada); and Celsius, Inc., (Goteborg, Sweden), 1988. Co-Author, Architects and Engineers; Malpractice of the Design Professional, Manual for Idaho Law Foundation, 1995. Author, Competitive Bidding for Public Works in Idaho, Manual for seminar presented to Idaho Association of School District Superintendents, 2001, 2003. Co-Author, Trial of the Design/Build Case, American Bar Association, Forum on the Construction Industry Program, San Francisco, California, 1996. Instructor, Arbitration Advocacy Course, Northwest Dispute Resolution Institute, Moscow, Idaho, 2000-2006. Panelist, Hardship Events and Construction Management, Allocating and Managing Risk, Superconference (Contractor and Construction Management Issues), 2005. Public Contracting in Idaho, Seminar, Lorman, 2001, 2003. Comparison of COAA and AIA Construction, Contract Documents, COAA Idaho Chapter, Boise, Idaho 2004. Arbitrator Update Seminars, American Arbitration Association, 2004, 2005. Practical Construction Law Course and Idaho Public Contracting, University of Idaho, 2003. Key Clauses in Construction Contracts re: Disputes, Change, and Claims, Washington Group International, Corporate Counsel Workshop, 2005. Panelist, Public-Private Partnerships, American College of Construction Lawyers 23rd Annual Meeting, 2012. Supreme Court of California, January 5, 1972. Supreme Court of Idaho, May 22, 1972. U.S. District Court, Northern District, CA and Ninth Circuit Court of Appeals, 1972. United States Supreme Court, January 7, 1980. U.S. District Court Idaho, May 22, 1972. Chairman, Idaho Transportation Department Claims Review Board, Member-Dispute Review Board, 2003-2011. Boise Valley YMCA, Board of Directors, Executive Committee, Chairman-Strategic Planning, 2006-Present. Boise Metro Chamber of Commerce, Board of Directors, Member-Executive Committee, 1996-2003. Boise School District, Youth Athletic Advisory Board, 1997-2003.